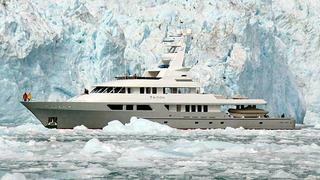 Interesting news now that Delta Marine's 50m motor yacht Triton has been sold at auction for $11 million. A distress sale by the finance house that took over the yacht, Triton was originally on the market asking $25.9 million. Built by Delta in 2004, she was designed for worldwide cruising and boasts a host of features. These include a hydraulically deployed tender towing system with a boom and self-tailing winch allowing tenders to be deployed while the yacht’s underway. A heli-deck is capable of carrying a Eurostar EC 130B4 helicopter and there’s a convertible skylounge and skydeck for indoor and outdoor use. Pullman berths are in all four guest staterooms allowing accommodation for up to 14 guests in addition to the owners.